What patients want to know about MRI machines. 1.2T, 1.5T, 3T - whats the difference? Everyone is encouraging patients to “shop around” for their healthcare. But that can be confusing when you don’t know exactly what to look for with an MRI! What machine is best? What questions should I ask? What does a 1.5T even mean? Shields MRI has been specially focused on MRI for more than 25 years. As the top MRI provider in New England, providing MRIs to one in every three Massachusetts patients (including the Patriots, Revolution, Celtics & Bruins), who better to provide education on what to look for in MRI machines? A quick overview of how an MRI works. MRI is short for Magnetic Resonance Imaging. To simplify a very complex machine, an MRI scanner is a very large, strong magnet. A patient lies in the magnet and a radio wave is used to send signals to the body and receive them back. The returning signals are converted into images by a computer attached to the scanner. MRI scanners come in different magnet field strengths measured in teslas or “T”, usually between 0.5T and 3.0T. They also come in varying sizes including, open and wide-bore. 3T MRI: the newest and most powerful. The image quality of an MRI depends on signal and field strength. So a 3T machine has much more signal than a 1.5T machine. 3T images can provide extremely clear and vivid images and can often be done faster, decreasing overall scan time. Both are of great value to the patient in terms of diagnosis and comfort. 3T is ideal for imaging small bones, breast MRI, musculoskeletal MRI, neurological MRI and vascular MRI, where the minute details are especially crucial to diagnosis. With that said, a 3T machine isn’t always the best for every kind of imaging. 3T has a higher likely hood of artifacts (any object that appears in the image that is not in the original object); specifically “flow” artifacts due to blood or fluid. Additional heat and more noise compared to a 1.5T can also be a challenge with 3T. A true open MRI vs. wide-bore MRI. A true open MRI means that the machine is open on all four sides. The machine looks almost like a pancake, with the top of the machine close to the face/head of the patient. True open MRIs started at a very low strength of .2T, progressed to .3T, to .7T and now to 1.2T. A 1.2T machine is capable of producing diagnostic images, but the laws of physics state that it will inherently have less signal than a 1.5T magnet and therefore the image quality is much lower. Today, a 1.5T MRI is considered the standard for state-of-the-art imaging. The open options for a 1.5T are in wide-bore format. The size of the ‘hole’ (or bore) where the patient lies is 70 cm, providing more headroom than a true open MRI and is actually much more spacious – it is just not open on the sides. Many patients prefer the open feeling that a 1.5T wide-bore offers vs. the additional room for limbs. While the true open model is still advancing, many physicians and radiologists much prefer the images produced on the higher strength 1.5T MRI for more accurate diagnosis. 1.5T is considered state-of-the-art in medical imaging. Today, the standard for MRI in a clinical setting is a 1.5T MRI. A 1.5T machine is faster than lower strength MRIs and is ideal for abdomens and chest MRIs (where patients are asked to hold their breath for the MRI sequence). Where there is more signal with a 1.5T magnet than a 1.2T magnet, there are great options as to what can be done with the extra signal – you can run shorter scan times (reduces possible motion) and have higher quality images. The Corolla, the Lexus and the Ferrari – a new way to look at MRI. A fun way to look at the strength of an MRI is through this example: Let’s say a 1.2T magnet is a Toyota Corolla– a 1.5T magnet is a Lexus – a 3T is a Ferrari. The Ferrari is in a league of its own, but is not practical for all purposes (goes extremely fast, sits low to the ground, etc.). The Toyota Corolla and Lexus however are a lot closer to each other, but the Lexus has more features, better reputation and more advantages. If you were offered a brand new fully loaded free car, which would you prefer, the Camry or the Lexus? Another analogy is a hi-def TV – would you prefer a 70 inch set (1.5T) or a 56 inch set (1.2T). While the 56 inch set would do the trick, watching the Super Bowl on a 70 inch high-def screen would allow you to see every play at a better angle. Shields MRI- a commitment to quality. 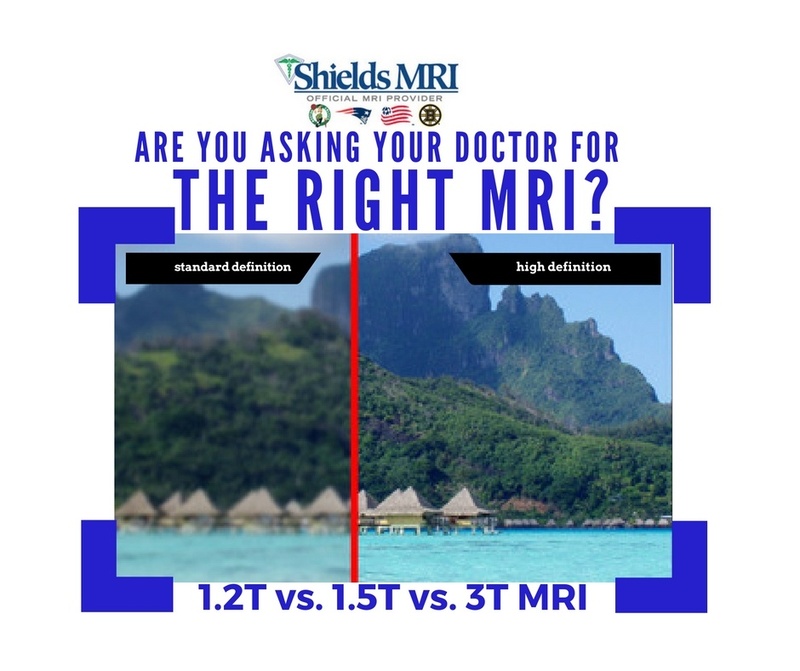 Shields MRI offers only 3T and 1.5T strength MRI machines in our network because we believe that these are the best options for our patients, physicians and radiologists. We are committed to providing the very best MRI experience by offering powerfully advanced GE, Siemens and Philips MRI machines from the most experienced staff and radiologists.